After hearing three favorable first hand reports of spins in the Glasair, I decided to try spinning our Glasair RG. Even though I was violating the Glasair’s placard prohibiting intentional spins in the airplane, I hoped to learn more about the handling characteristics of the Glasair. The aircraft, N84AG, was lightly loaded with pilot, parachute, header tank full, and about 14 gallons of fuel in the main wing tank. I began all tests at about 13,000 MSL near the base of an overcast cloud layer. The Glasair RG used in this test is equipped with inverted fuel and oil systems. The inverted fuel system was in use during all spin tests to prevent fuel starvation. Empty weight of this aircraft is about 1135 lb, equipped with a Lycoming 10-360, 180 horsepower engine with an aerobatic constant speed propeller. Our new larger rudder was also installed on the plane. Initially, I tried spins to the right, using standard pro-spin procedures. I approached the stall with moderate power settings for the first few spin entries (19 inches, 2400 rpm). With the nose at a high angle of attack and power on, I reduced power to idle a few mph above stall speed, then pulled abruptly straight back on the stick and kicked right rudder. The first right hand spin actually didn’t seem to want to spin as it buffeted in and out of a spiral and spin. This rocking horse maneuver picked up speed quite quickly and after about 3 turns, I initiated anti-spin maneuvers (opposite rudder and stick forward). This recovery procedure worked fine and I lost about 1,000 feet of altitude. The next right spin was entered similarly. It broke, however, into a legitimate spin and began to stabilize after about two turns. After two turns I immediately initiated anti-spin procedures not really wanting it to progress any further until I knew I could stop it. I noticed that in these spins, opposite rudder did little, if anything, to initiate recovery. Forward elevator was the most authoritative control input that made recovery possible. Recovery was rather rapid with the exit from the spin vertically straight down. Recovery took about one turn. This is only an estimate, however, because the plane spun so fast (about 360°/sec.). I tried one more spin to the right like the previous one, with the same entry procedure. It behaved exactly the same as the one before. I thought, “Well, here’s some consistency.” I tried a fourth spin to the right, only this time with a more aggressive entry, full power, and more rapid control inputs. It stabilized in one turn and really did make my head spin. Having confidence from the previous spins, I let it go 4 turns this time before beginning recovery, using up about 2000 feet from 13,000 to 11,000 MSL, including recovery. Again, rudder did little, if anything, to effect recovery; only full forward stick really worked. It was as if, as soon as the wings unstalled, the rudder would hook, stopping rotation quickly. Those of you who have flown the airplane know how powerful the elevator is. All of these spins were with neutral ailerons; no in- or out-spin aileron was tried. I knew about spins from several other aircraft that I had spun – what in-aileron does (aileron in the direction of the spin), what out-aileron does, what effect power has depending upon rotation direction, what forward elevator does if pro-spin rudder is applied, etc. I also knew that spinning to the left could be more hazardous than to the right, because of engine rotation direction. If you add power in a left spin with engines that rotate clockwise as seen from the cockpit, the spin will tend to flatten. Gaining confidence in right spins, I decided to try one to the left. I climbed again to 13,000 MSL. Intentionally, I entered the left spin very aggressively. The spin began to “stabilize” almost immediately, and seemed to be accelerating. I let two turns pass by and decided to get out of this one. I used the same anti-spin procedures I had learned for right hand spins. Nothing happened – I mean nothing! – except that it seemed to accelerate even faster. One more turn went by, while I quickly figured what to do, looking at the ground coming at me fast. I thought to myself, “I must unstall that wing!” How? I tried in-aileron-nothing.. out-aileron -nothing.. .power – nothing. I still had full anti-spin rudder and forward stick. Six turns had gone by as I was fast approaching somewhere around 10,000 feet – I didn’t have much time to pay attention to the altimeter. I noticed, however, that in-aileron caused the nose to lower, and out-aileron caused the spin to flatten. “Maybe I could ‘rock it’ from out-aileron to in-aileron, unstalling the wing,” I thought. On the seventh turn, I pulled it into a flatter spin with full aft stick, right aileron, and anti-spin right rudder. Then, abruptly, I moved the stick to the full forward, left aileron position. The plane lurched forward almost onto its back as I pressed negative into the straps. Trying to keep it from going into an inverted spin, I eased back on the stick, aiming straight down, and pulled the plane back, somewhat cautiously, to a level attitude. Wow! A few more seconds and I would have had to think about bailing out. I was about 9,000 MSL as I reached level flight attitude. Needless to say, I didn’t try a spin to the left again. I tried one more spin to the right after the left spin and let it go about 4 turns; the airplane recovered fine. I have a few theories (one of which is the direction of engine rotation) on why this particular aircraft seemed to exhibit less than desirable spin recovery characteristics when spinning to the left. More actual testing, however, would be needed to verify these theories. Every aircraft is different and will exhibit different flight characteristics. I was lucky, I could just as easily not have been so lucky. We cannot stress this point more, DO NOT intentionally spin any model of Glasair aircraft. There are too many variables and unknowns to deal with, such as; type of entry, control inputs, CG, control rigging, wing and stabilizer incidence angles, aircraft weight, stall strip placement, etc. Everyone’s airplane is different and will exhibit different spin and recovery tendencies. Spinning an aircraft with unknown flight characteristics is probably one of the most dangerous test flight operations possible. Our very first prototype, N88TH, was spin tested to a very limited extent. It was spun 3 times in both left and right spins with very favorable results. The aircraft was lightly loaded with pilot, parachute, and minimal fuel. It spun quite nose low and responded favorable to conventional anti-spin control inputs. At that time we were primarily interested to see if the aircraft exhibited “normal” spin tendencies in both directions, and that recovery would be possible in the event of an accidental inadvertent spin. All of our prototype Glasairs exhibit very docile stall characteristics with the inboard leading edge stall strips installed. All of our builders, to our knowledge, have reported similar stall characteristics. In conclusion, the type of entry determined the “personality” of the spin and how it stabilized. Conventional anti-spin control inputs did not work with this particular aircraft, especially in spins to the left. The aircraft rotated fast and lost altitude fast while in a spin. Opposite rudder had little, if any, effect on recovery. Recovery was always vertical, taking about one to two turns. To put the aircraft into a spin took deliberate control inputs. If a person is familiar with standard spin recovery techniques, he should be able to prevent the airplane from ever going beyond a one turn spin, or even entering one It takes about 2 turns before the spin begins to stabilize. Anyone who is considering any aerobatics in the plane should have spin training in another aircraft like a Pitts so he knows what to do in the event of an inadvertent spin. The power-off stall characteristics are quite docile. (When the stall strips are installed correctly, the plane actually tends to mush straight ahead during power off stalls.) Power on stalls (rpm over 1500) are more pronounced and will drop off on a wing more easily. We recommend NOT doing power on stalls over 1800 rpm for they can more easily cause a spin entry. 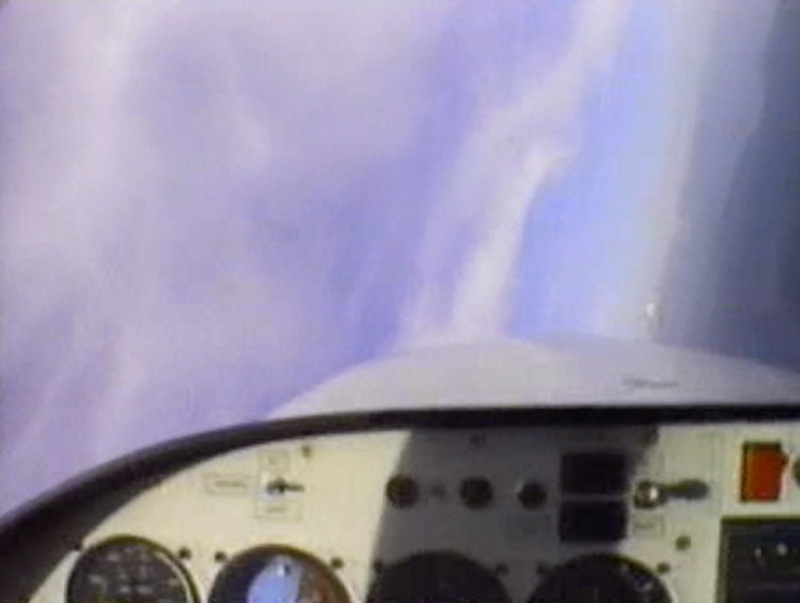 Allow yourself 4000 to 5000 feet AGL when practicing any type of stalls. Spin discussions should not put a fear of slow flying into anyone. Slow flight is the best practice to become thoroughly familiar with an airplane’s control and handling characteristics. Practicing slow flight and stalls should be done on a regular basis to build confidence. This will help you maintain short field take off and landing proficiency. If you do not maintain slow flight and stall proficiency, you may notice a gradual tendency to fly faster approaches and longer, sloppier landings. Confidence in your aircraft’s ability to fly slowly and stay in the air should be maintained. When doing aerobatics in the Glasair at or below the stall speed, such as in a hammerhead stall or similar maneuver, keep the angle of attack of the wing to the relative airflow low so as not to stall the wing. With the stall strips properly installed, you will notice plenty of buffet prior to a stall at any airspeed; so neutralize the stick to prevent stalling whenever this buffet is felt. Aerobatics in the Glasair should only be undertaken after competent instruction. We recommend getting some aerobatic training in a plane certified for intentional spins, such as a Pitts or an Eagle, before attempting aerobatics in a Glasair. The question of unintentional spins may be nagging you while reading this article. You are probably thinking, “I sure don’t intend to do any intentional spins in my Glasair, but would like the grace afforded for human error and an unintentional spin without any dire consequences.” Please be assured that there is a world of difference between a full stall when the nose drops and the spin starts, and a fully developed intentional spin. In our Glasair demonstrations and flight testing, on occasion we have arrested unintentional spins when the wing drops off, the lose lowers, and rotation begins. As long as the pilot recognizes the stall and spin entry, and then initiates proper anti-spin control inputs in a calm, purposeful way, the spin has always stopped within 1/2 turn and with minimal altitude loss. From our experience, we believe that unintentional spins should never fully develop unless the pilot is simply asleep at the stick. NASA has carried out an extensive research program on spinning using a Grumman aircraft. Their report, “Exploratory Study of the Effects of Wing-Leading-Edge Modification on the Stall/Spin Behavior of a Light General Aviation Airplane,” NASA Technical Paper 1589, is good reading material. This report is available from the National Technical Information Service, Springfield, Virginia, 22161. There are also many books on spinning and spin recovery, and good articles often appear in aviation magazines (see the August, 1984 Sport Aviation and the February, May, October, and November, 1985 Sport Aerobatics. We recommend going to your local aviation type store for books such as: Stalls, Spins and Safety by Mason, Anatomy of a Spin by Lowery, All About Stalls and Spins by Gentry, Aerobatics by Williams, Flight Unlimited by Muller, and Aerobatics Today by O’Dell. Remember, however, that every airplane is somewhat different and the techniques used for one aircraft may not work for another. Even a Cessna 150, with certain control inputs, has undesirable spin recovery characteristics. We have placarded the Glasair against spins for a good reason, please respect our precautions. We do recommend that all Glasair pilots become familiar with proper spin recovery techniques and, if possible, get some professional spin training in an airplane certified for intentional spins. Bob Gavisky was the former president of Stoddard-Hamilton Aircraft Inc.